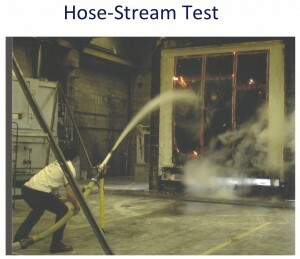 Click Here to view a pdf explaining the hose stream test and its implications. The hose stream test was developed in the late 1890s to measure the structural integrity of floor materials and cast or wrought iron in building walls during an intense fire. It was not intended or designed to test the thermal stress performance of glazing materials. Today, prescriptive building codes in the U.S. and Canada (but not in Europe or elsewhere) require application of fire rated glazing that passes this archaic test, unless a local code authority determines otherwise. A glazing product is placed in a furnace heated to over 1600º F for 45 minutes, and higher temperatures for longer ratings. Afterward, water is delivered via a hose stream from 20 feet away with a force of 57.7 lbf at 30 psi and 86.6 lbf at 45 psi. If the glass remains intact without exceeding the tolerable openings, it passes the test. The NFPA 257 (Fire Tests of Window Assemblies) hose stream test allows for a 30% loss of glazing around the perimeter and a 5% loss at the center. Does NOT tell you how the glazing performs in a sprinklered building. According to a 2001 position paper by Schirmer Engineering Corporation, the hose stream test has nothing to do with modern fire fighting practices or strategies. In a real fire, sprinklers activate at about 165º F, which usually occurs within a few (not 45 minutes) of the fire’s initial outbreak. Sprinkler discharge at these relatively low temperatures virtually eliminates any threat of thermal shock. Does NOT tell you what happens to glass subjected to hose streams at close range. In the real world, 45-minute fire rated glazing is most often used in egress corridors measuring only six to eight feet wide. No fire rated glass manufacturer has demonstrated that any fire rated glazing product can withstand the force of a hose stream at distances closer than 20 feet. Does NOT tell you how well glazing blocks smoke, flames or radiant heat. Since the hose stream test allows losses of 5-30% of the glazing product, the broken glazing loses its ability to block smoke and flames. And, the hose stream test offers no information about whether or not the product will block the dangerous transmission of radiant heat. NFPA 251, ICC model codes and ASTM E-119 specifically exclude fire-rated construction of less than one hour from the hose stream test requirement. Yet, 45-minute glazing, which is limited to no more than 25% of the total wall area must pass the hose stream test. For decades, 20-minute glazing products have been exempt from meeting the hose stream test. It is generally accepted among door manufacturers that about 75% of the U.S. fire-rated door vision panel market is 20-minute product without hose stream. Fire Safety. The International Organization for Standardization (ISO) dropped the hose stream test about 50 years ago. So, has fire safety been compromised? On the contrary. According to the National Academy of Sciences, the death-by-fire rates in the U.S. are two to four times higher than in Europe. Radiant Heat. Traditional wired glass and ceramics can pass the hose stream test, but neither product offers protection from invisible, electromagnetic wavers of radiant heat that can spontaneously ignite combustible materials or cause unbearable human pain. Increased Costs. Without evidence of fire safety, thermal shock, or other benefits from products with hose stream, it is difficult to justify the added cost of using filmed or laminated ceramics instead of clear, tempered fire rated products. The opportunity to use value-added materials without hose stream exists through the “alternative materials and methods clause” contained in most every building code adopted and applied in the U.S. Under Section 104.11 of the IBC and 104.9 of the International Fire Code, the local code authority has the right to take exception to prescriptive code requirements and approve alternative methods or materials that fulfill safety and performance requirements. Millions of square feet of glazing without hose stream have been installed worldwide without reported failure. This successful fire performance record supports use of these products in the U.S. under alternative materials code provisions. Designers and contractors can save money and install clear glazing that provides increased fire safety including protection from radiant heat by applying alternative materials clauses. In 2007, this school decided to replace the existing wired glass in their building in order to prevent injuries stemming from accidental impact from wired glass. SuperLite I, a clear, CPSC Cat. 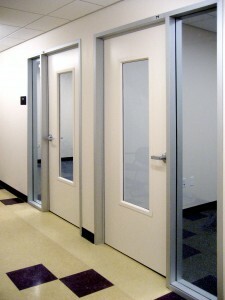 II impact safety rated product, was used in all 20 minute doors. The school chose SuperLite I-XL, another clear, CPSC Cat.II product, or all the 45 minute sidelites and windows because of the partial radiant heat protection it provides without incurring additional costs. Because the glazing is without hose stream, the architect submitted the product literature and technical bulletin to the City of San Francisco and the application was approved.